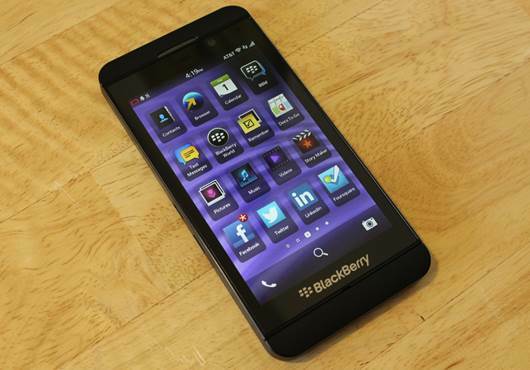 It’s only a smartphone, but much rests on the BlackBerry Z10’s slim shoulders. It’s the first phone to sport the long-awaited BlackBerry 10 smartphone OS, and carries with it all the hopes of a once-great technology company. With BlackBerry’s (formerly RIM) share price and sales on the slide, the Z10 needs to make a big impact if it’s to have any hope of turning the firm’s fortunes around. As such, perhaps it’s appropriate the new phone bears more than a passing resemblance to the most successful smartphone around. 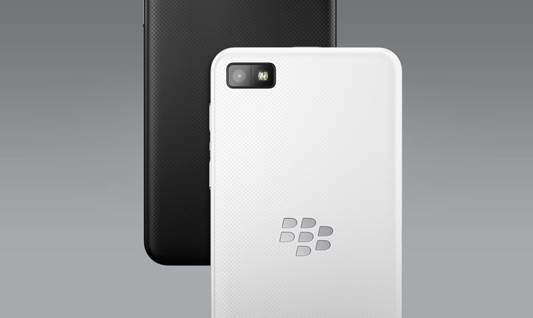 From the profile of the rounded corners to the flat, chopped-off edges, the Z10 looks like the iPhone 5’s big brother. If it’s a sibling, though, it’s certainly the uglier one, with its textured, cheap-feeling, soft-touch plastic rear and thicker 9.3mm waistline proving much less alluring than the iPhone’s aluminum frame. Still, we do appreciate the minimalist design – the volume rocker on the right0hand side and the power button on the top edge are the only physical controls and the 4.2in, 768 x 1280 display strikes the right balance between screen real estate and pocket ability. The Z10 is nothing if not practical, though. Lever off the back of the phone and you’ll discover a replaceable 1800mAh battery and a microSD slot, which can be used to expand the existing 16GN of internal storage. There’s little else missing from the list of specifications: it has both front- and rear-facing 8-megapixel and 2-megapixel cameras, capable of capturing 1080p and 720p video respectively; there’s Bluetooth 4, NFC and dual0band Wi-Fi covering the wireless side of things, plus 4G compatibility. On paper, the Z10’s core specification looks competitive, with a dual-core 1.5GHz Snapdragon S4 Plus processor backed up by 2GB of RAM, which puts it right up there with the best on the market. And the first time you fire up the Z10, the signs are good. Slide a thumb from right to left to access the app drawer, take a peek at your messages, swipe through an inbox or two and all is well. Web pages in the browser respond well to pinch, pan and scroll gestures, and even HD video streamed via YouTube plays smoothly. Start to dig a little deeper, fire up a few apps and leave them running, however, and things look less rosy, with animations and transitions from screen to screen juddering frequently. Demanding 3D games were occasionally reduced to a crawl: Wipeout-clone Ragged Edge started dropping frames significantly when the action started to heat up. Running the SunSpider browser benchmark revealed that the browser isn’t the quickest either. It completed the tests in a time of 1902ms – slower than both the iPhone 5 (932ms) and Samsung Galaxy S III (1430ms). The display is altogether more impressive. Here, the benchmark is the iPhone 5, which reaches an eye-searing 582cd/m2 at its highest setting. The Z10 outstrips it. Indeed, we measured it at an astonishing 715cd/m2, making it the brightest phone screen we’ve come across by some distance. We should point out there’s no way to disable the auto-brightness setting, so the BlackBerry Z10 reaches this high brightness only under direct and full sunlight. The rest of the time it hovers somewhere between 300cd/m2 and 400cd/m2, which is fine. It’s also possible to turn down the brightness threshold manually. You might think that would help battery life, but, when we came to testing this aspect of the z10’s performance, we were underwhelmed. The phone has an 1800mAh-capacity power pack, which had 60% remaining on the gauge after 24 hours, during which we carried out a number of tasks designed to simulate a light workload. This figure is about average for a modern smartphone; better than the Samsung Galaxy S III and Nokia Lumia 920, and level with the iPhone 5. The camera is passable. In low light, photos exhibited much more noise than the same scene snapped on an iPhone 5.we found autofocus unreliable, resulting in lots of soft, blurry images. In better lighting, and when you do manage to get the focus bang on, however, results are perfectly acceptable – well exposed, with natural colors and a decent amount of detail. There are some fun features to play around with in the camera app, the best of which is the Time Shift feature. This snaps a sequence of shots and then allows you to choose a frame, using a slider to scrub back and forth through the sequence. There’s also a selection of filters that can be applied to both stills and video, while the Story Maker app lets you put together a quick video montage of clips and photos, complete with backing music and titles. The hardware, then, is a mix of good and bad. The software it’s running, however, is a much more consistent affair. In fact, considering this has been built from the ground up, it feels incredibly seasoned. It isn’t the features, though, nor the look of the interface that grabs the attention first; it’s how BlackBerry has implemented the touchscreen gestures. 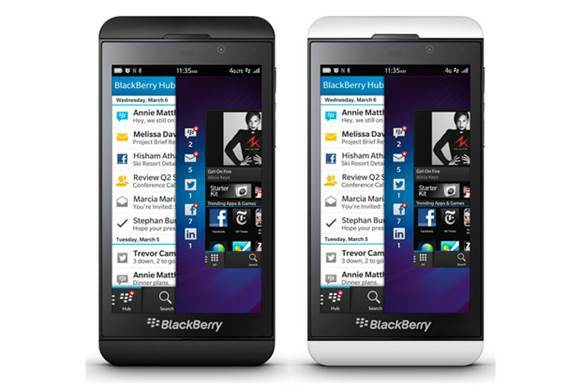 Like the PlayBook, and also Windows 8, the Z10 makes extensive use of edge-swipes to access key features. With the phone in standby, you can swipe up to unlock the phone. From the lock screen, a swipe down from the top edge puts the phone into bedside mode. A single swipe from the bottom of the screen in any app takes you back to a multitasking view, where you can switch apps, dismiss them with a tap, or swipe right to left to access the app-launcher view. Finally, and most usefully, if you swipe up from the bottom of the screen in any app and hold down your finger, you can take q quick peek at your messages, then swipe right to access the BlackBerry Hub.